Getting to know Topcoder Admins: Meet kbowerma - Kyle Bowerman! Getting to know Topcoder Admins: Meet kbowerma – Kyle Bowerman! So, we continue with the Getting to Know Topcoder Admins series with Kyle Bowerman’s interview today. Kyle is one of our software architects. He has been an awesome team member at Topcoder for more than 6 years. Tell me a little bit about your background and how did your Topcoder story begin? I came in through Appirio, I actually was the 64th employee there and was asked if I wanted to help with a new emerging crowdsourcing practice which was called AC/DC. (Appirio’s Cloud Development Community) but later we changed the name to Cloudspokes. What is the tech stack you like to work with the most and why? What’s the most challenging thing you have to do as a Software Architect? How do you deal with it and also with everyday problems that come your way, in your role as an Architect ? Since the co-pilots have gotten so good, they have enabled us to serve more customers at the same time. So I feel like I am always trying to juggle with who needs the next thing from my end. There is also a context switching tax when you are working on so many different things. Ha Ha, that is a good one. My wife always says I have Hobby Cancer! 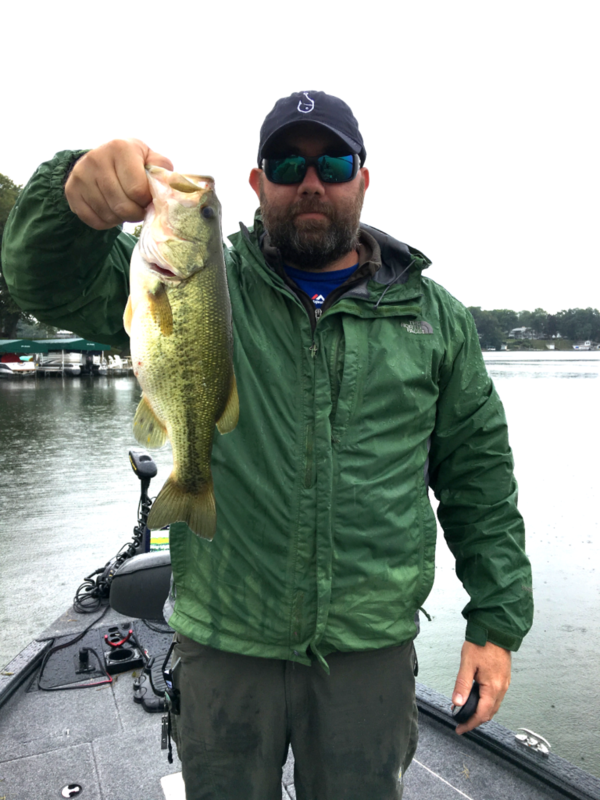 I really like to fish. I mean I Looove to fishing. While I was in college, I was a fishing guide in Alaska and Montana. I recently took up fishing again and started airbrushing blank lures and pour soft plastics molds. I even started BowermanBaitCo.com. where I sell my lures. I don’t really make any money but it is fun. I also spend some time gardening, woodworking, photography, Microcontrollers, home automation and restoring old hand planes. What do you like the most about the Topcoder community? Oh that is an easy one: the people! Meeting the members and co-pilots from around the world is the best! Developers are like Makers. They like to show you what they have done and talk about what they have learned. Describe the optimal client type you like to engage with? Cryptocurrency seems to be a disruptive element in the digital exchange market nowadays. What do you envision the future for Topcoder and Cryptocurrency? That is a good question. I would like to see Topcoder do more with startups and have them give the option to pay in crypto or and ICO of their company. I think that would be really cool and revolutionary. What is it like working with copilots and solving problems together? What are the best qualities you expect a copilot to have? I like it, when the co-pilot sees the solution before I do, which now happens most of the time. Our copilots are really great, smart people and I have learned a lot from them. Not just technical but time management too. Callmekatootie would always calm me down when I was freaking out about timelines on a project and I will never forget that. He is very wise. Funny how you have never seen him and Yoda in the same room. Assuming you would have to pick a different role within the community, which of these would you choose and why? A: Competitor; B: Copilot; C: Reviewer. B Competitor, but I would be poor at being one. If you could travel to visit 2 Topcoder members in their respective countries, who would they be and where? I think I would visit either Gondzo in Sarajevo or Walrus71 in Budapest. Which of the emerging technologies (Artificial Intelligence, Blockchain, The Internet of Things, Virtual Reality, Other) will cause the most disruption to businesses in the near future and how do you see them affecting Topcoder? Artificial Intelligence because it will change how humans interact and even how development happens. 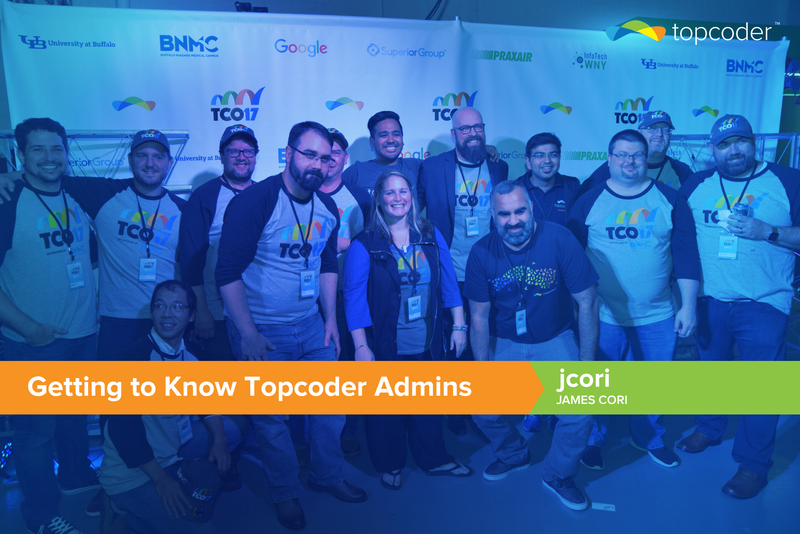 Getting to know Topcoder Admins: Meet jcori – James Cori! Getting to know Topcoder Admins: Meet nick.castillo – Nick Castillo! 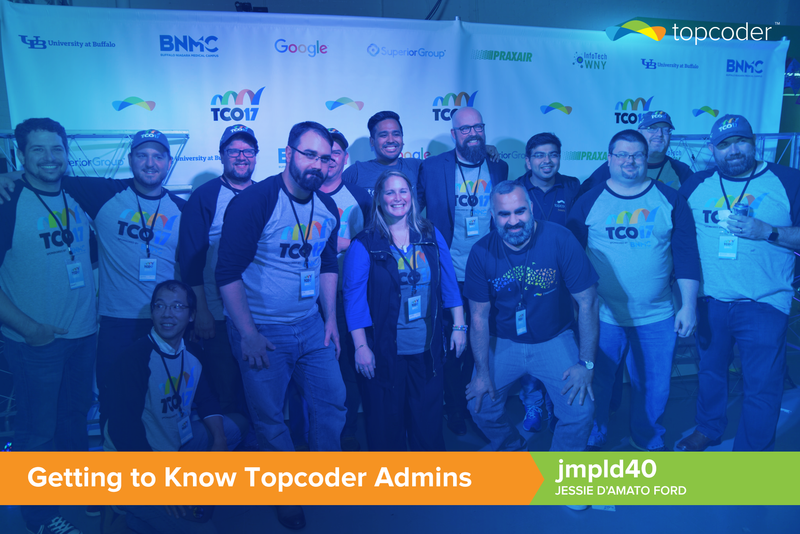 Getting to know Topcoder Admins: Meet jmpld40 – Jessie D’Amato Ford!